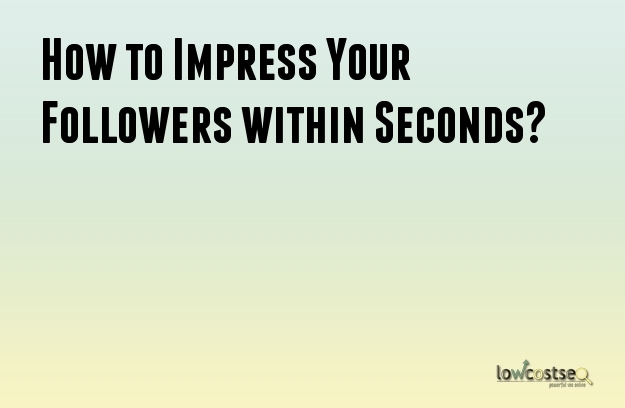 How to Impress Your Followers within Seconds? These days it has become more convenient and easy for business entrepreneurs to reach out to their customers. All thanks to the latest technology i.e. the Internet! Yes, this virtual world has changed the meaning of doing business. In the earlier days, when entrepreneurs thought of launching their businesses the real challenge was to bring it to the notice of their potential or targeted customers. They had to make use of traditional marketing and advertisement techniques to convey their messages about their business and products. This was certainly time-taking and expensive. However, after the evolvement of the Internet, advertising and marketing has not only become inexpensive but also less time-consuming. Well, in order to make your business presence felt in the virtual world it is important that companies maintain their personal websites. But, with rapid upgradation of technologies just by launching a website is not enough for successful marketing. Entrepreneurs need to make use of other modes and methods to reach out to their customers apart from their websites. So, how can you draw the attention of your viewers in about 8 seconds? It is important that the language that you use for writing your content should be globally accepted. As customers visit websites that use languages which are easily readable and understandable. So it is important that you choose the right medium to convey your marketing message and draw the attention of maximum traffic. Making use of various mediums of communication is important. It is not necessary that every customer is comfortable using all types of medium or channel. Some may prefer reading messages; few prefer e-mails, whereas there are some customers for whom you need to use the audio channel to convey your marketing or an advertising message. It is important that you make optimum utilization of all channels that are available these days. It is important that you write meaningful content in your web page. Clients basically search the Internet for information that they are unaware of or needs a better understanding of. So, it is important that you keep in mind the queries that clients can have regarding your products and services. It is only relevant information that can attract the attention of the customers. Once you have impressed your customers with your content and you have managed to gather their attention it is important that you mechanize your website in such a way that readers who are interested in your products and services are able to get in touch with you instantly. This is why it is important that you design your website efficiently. In order to get the loyal attention of customers, it is important that you provide your customers with incentives and exclusive offers. You can apply the basics of marketing strategies like display loyalty programs, price promotions, and offers. These marketing strategies will certainly come in handy and also help you to increase the traffic, as your existing customers will certainly get fresh customers to your website.